In today’s era of an enduring and continuous industrial evolution, we understand the dynamic requirements emerging in the market. The persistent and round the clock efforts have infused a commendable pace in the sustenance to exceed the contemporary quality standards to produce “KAMACHI TMT Re-bars”. The adherence to quality has helped the group to survive and rapidly grow in this highly competitive industry. 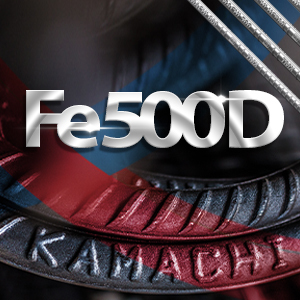 This widely accepted grade from Kamachi is manufactured with minimum 10 % higher strength than BIS standards and can save up to 15 % when compared to ordinary TMT bars. Excellent elongation, bend and re-bend properties and superior weld ability makes Kamachi TMT the preferred choice of engineers and bar benders alike. Also known as the Earthquake Specialist, the 'D' denotes the extra ductility of the rebar. The best qualities blooms ensure extremely low levels of Sulphur and Phosphorus impurities. The lesser these elements, the greater the ductility and ability to withstand the tremendous shock load produced during earthquakes. 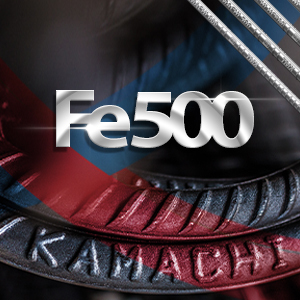 Kamachi Fe500D bars not only offers better value and durability than presumed leading brands, it is also trusted by India's leading industrial houses. 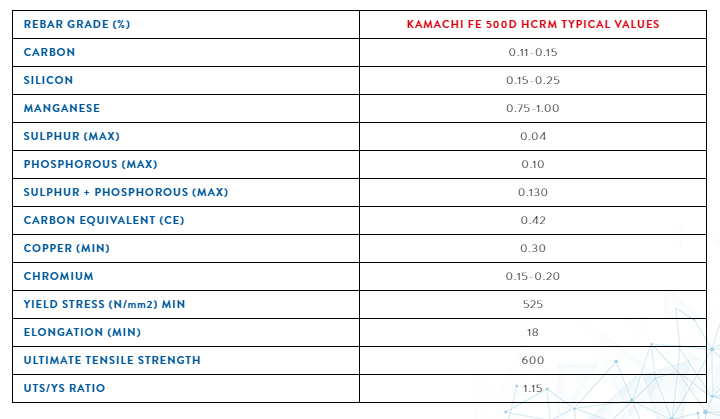 Kamachi HCRM (High Corrosion Resistant Material) is an Fe500 steel that has the added elements of Chrome (Cr), Nickel (Ni) and Copper (Cu); that are present uniformly from core to surface, fight corrosion from sea water, acidity and salinity and maintain structural strength. The price difference compared to normal Fe500 is negated and the differential cost converts to savings against foundation re-strengthening and annual maintenance. The presence of higher corrosion resistant elements and availability at lower rates than market leading brands and main steel plants is a positive point in addition to increased structure life. 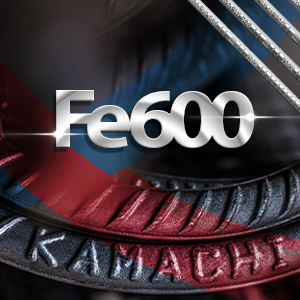 Kamachi Fe600 is the steel for new age high-rise constructions. The steel strength of 600 MPa offers a 20% increase in load bearing capacity leading to atleast 4% lower steel consumption and immense savings; value for money. The extremely low sulphur and phosphorous content gives the steel increased ductility to withstand wind loads and jerk loads during earthquakes. 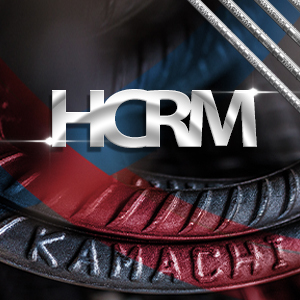 Being pioneers to launch this special quality steel in the market, it is priced equivalent to HCR bars, providing maximum benefits at minimum costs. The application of technology to any process achieves accurate control on all required parameters. Processing steel at the job site is hard, disorganised endless productive. The emerging trend is to shift steel processing to service centres, which offer a controlled environment. Readymade steel processed at our factory saves money through reduction of time and manpower. Readymade steel accelerates construction time and helps construction firms tide over scarcity of skilled labour, stringent timelines and quality standards while adhering to health and safety guidelines. Elimination of onsite labour with delivery of customised readymade steel coordinated to construction requirements saves processing time. There is no wastage of steel as there is no onsite processing. The customer only pays for the actual steel used, blueprint weight, saving on waste, processing and freight. Material is ordered and delivered as per need eliminating the need for storage. There is no loss due to theft of stored steel. Advanced robotic technology is used in the processing of steel. This helps achieve accurate control over all required parameters for superior quality. The steel bars are bent using the latest technology in a controlled factory environment. This achieves absolute accuracy. Mechanized processing enables us to customize shapes and designs as per requirement. This provides absolute freedom of design.